With dozens of safaris dotted throughout Africa, there’s enough variety to keep the keenest zoologists occupied. Whether on the lookout for a shaggy mane or a horned mammal, there is plenty to see and do in these top safari destinations which house some of the most impressive variety of species in the entire world. Hwange National Park (formerly Wankie Game Reserve) is the largest game reserve in Zimbabwe. It is known for its abundance of giraffes, elephants and lions as well as 105 other mammal species. Hwange also has one of the largest populations of wild dogs left in Africa. Unfortunately, even though it was established as a national park in 1928, the park has had several poaching incidents. The most renowned was In October 2013 when it was discovered that poachers had killed a large number of African elephants with cyanide by poisoning their waterhole. Conservationists have claimed the incident to be the highest massacre of animals in South Africa in 25 years. Two aerial surveys were carried to determine the extent of the deaths and 19 carcasses were identified in the first survey and a further 84 carcasses in the second survey. Tougher poaching laws have been introduced since and the wildlife numbers have been on the rise. The park covers 14,651 km² and is home to over 100 mammal and 400 bird species. Ngorongoro is located in north-western Tanzania. The main feature of the Ngorongoro Conservation area is the Ngorongoro Crater; the world’s largest inactive, intact and unfilled volcanic caldera. The crater, which formed when a large volcano exploded and collapsed on itself two to three million years ago, is 610 meters (2,000 feet) deep and its floor covers 260 square kilometres (100 square miles). Approximately 25,000 large animals, mostly ungulates, live in the crater. During the wet season 20% of the wildebeest and zebra migrate out of the crater while buffalo and eland do the opposite. Interestingly, the native people of the area, the Maasai, still live within the conservation area and it’s also home to Olduvai, a place where some of man’s earliest remains have been found. 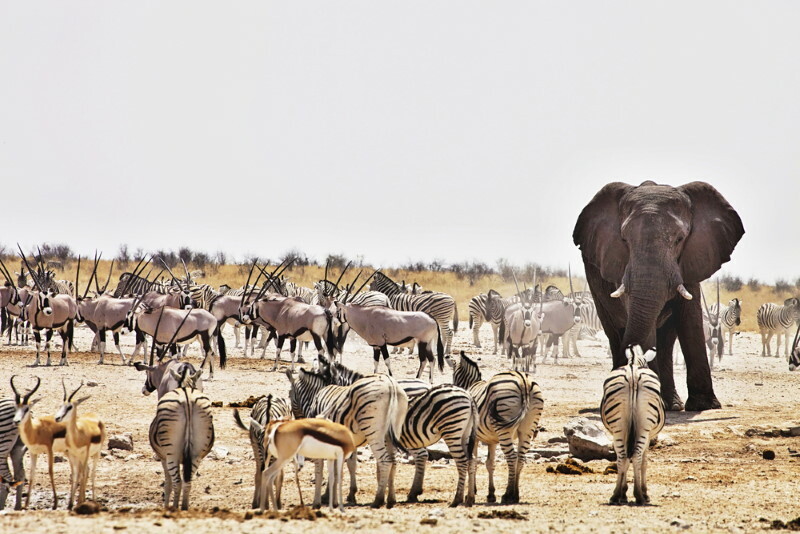 First established in 1907, Etosha is Namibia’s oldest and one of it’s most popular wildlife destinations. The park is home to Africa’s tallest elephants, the endangered black rhino and 91 other species of mammal. Etosha is especially popular with photographers in the dry season who flock to the waterholes (along with the wildlife), but most visitors are guaranteed to see plenty of giraffe, elephant, lion and rhino along with a huge variety of birdlife. Etosha National Park doesn’t offer scheduled game drives – it’s a self-drive safari experience – and the attraction covers 22,270 square kilometres (8,600 sq mi) and attracts over 200,000 visitors a year. Bwindi Impenetrable National Park is situated in south-western Uganda in East Africa. 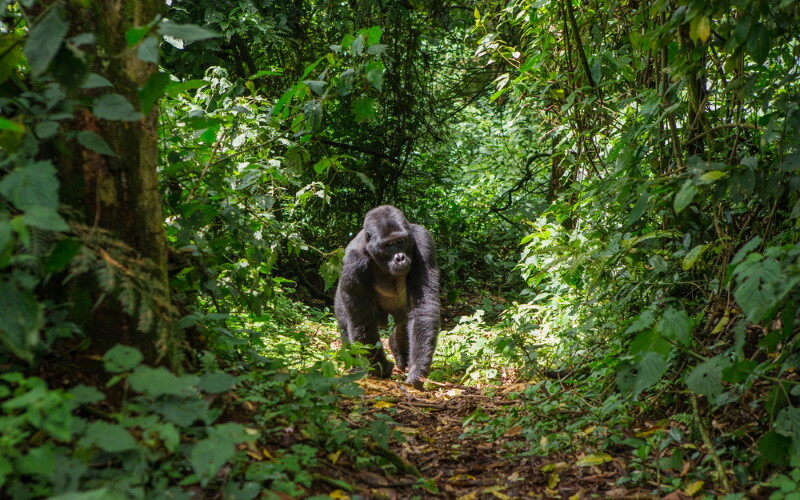 The park is home to almost half of the world’s population of mountain gorillas. It comprises 331 square kilometres (128 sq mi) of jungle forests and contains both montane and lowland forest. It is the only park on this list that is accessible only on foot. The park provides habitat for some 120 species of mammals, 348 species of birds, 220 species of butterflies, 27 species of frogs, chameleons, geckos and many endangered species. Bwindi was only established in 1991 and has since been added to the UNESCO world heritage list. The park can be visited any time throughout the year, although conditions are more difficult during the rainy season. The Serengeti National Park in Tanzania offers the absolute seminal African safari experiences. The grasslands make the Serengeti a fantastic view for spotting lion kills because you can see the whole spectacle clearly and it is also famous for its annual migration of over 1.5 million white bearded (or brindled) wildebeest. First established in 1951, the 14,750 square kilometres (5,700 sq mi) park attracts 350,000 per year and it was listed as a UNESCO World Heritage Site in 1981. 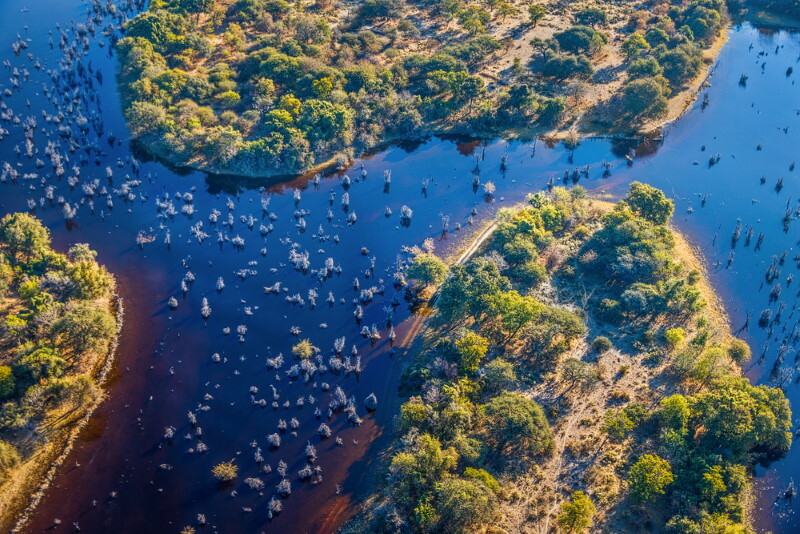 The Okavango River cuts through the center of Botswana’s Kalahari Desert, creating a unique inland water system that gives life to a huge variety of birds and mammals. The Okavango Delta is a unique safari destination because you can view wildlife both from land and water, sometimes in a traditional canoe (a mokoro). Each year, the delta floods and covers over 16,000 kms. The best time to view wildlife is at the peak of this flood during the dry season from May to October. The wildlife is more concentrated on islands at this time and it’s therefore easier to see them. As the flooding recedes, new grass springs up and the wildlife scatters to feed. 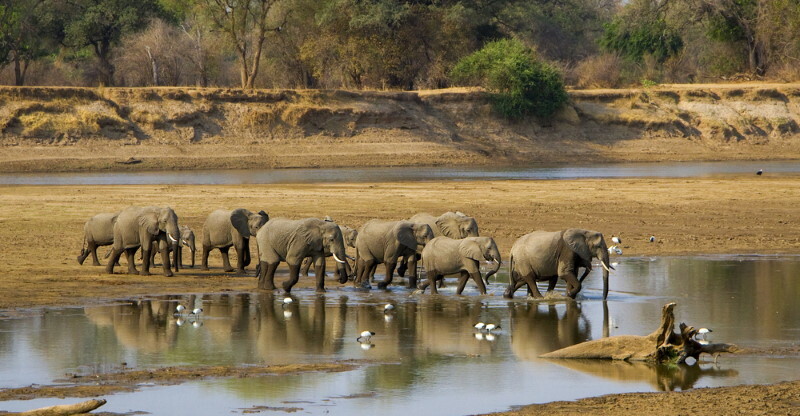 Established in 1972, the South Luangwa National Park spans 9,050 km² in Eastern Zambia. The park covers two ecoregions, both of them woodland savannah, and although it is generally well-protected from poaching, the park’s black rhinos were wiped out by 1987 and the elephant population has been under serious pressure at times. There is still plenty to see though with over 400 species of birds and 60 different animal species. The Luangwa river is filled to the brim with hippos and if you’re lucky you’ll spot prides of over 30 lions at a time. Home to the walking safari, the best times to visit South Luangwa is near the end of the dry season when the animals really concentrate around the remaining waterholes and make for a great safari experience. Kruger National Park is one of the largest ‘game’ reserves in Africa. It covers an area of 19,633 square kilometres (7,580 sq mi) in the provinces of Limpopo and Mpumalanga in north-eastern South Africa. Areas of the park were first protected by the government of the South African Republic in 1898 and it became South Africa’s first national park in 1926. All the Big Five game animals are found at Kruger National Park, which has more species of large mammals than any other African game reserve. Kruger is one of the best maintained parks in Africa which means it’s ideal for a self-drive safari, but if you’d rather take it easy there are numerous webcams set up so that you can observe the wildlife from afar. Chobe National Park in northern Botswana has one of the largest concentrations of game in Africa. By size it is the third largest park in the country (after the Central Kalahari Game Reserve and the Gemsbok National Park) and is the most biologically diverse. It is also the country’s first national park. Established in 1967, this park covers over 11,700km² and is divided up into 4 different areas, each with its own eco-system. The park is widely known for its spectacular elephant population: It contains an estimated 50,000 elephants – perhaps the highest elephant concentration of Africa – and is part of the largest continuous surviving elephant population. The population seems to have solidly built up from just a few thousand since 1990. The best time to visit Chobe is between April and October as herds of zebra, eland, buffalo, giraffe and wildebeest congregate around the Savuti marsh during this time of year. Chobe is accessible by car which makes it a little less expensive than some other parks and is thus much more popular with tourists. The Maasai Mara National Reserve (or The Mara as the locals call it) is a large game reserve in Narok County, Kenya. The word Marra comes from the native word Maa for “spotted”, which is an apt description for the circles of trees, scrub, savannah and cloud shadows that mark the area. It is globally famous for its exceptional population of lions, leopards and cheetahs as well as for its annual migrations of zebra, Thomson’s gazelle and wildebeest to and from the Serengeti each year from July to October. Originally set up as a wildlife sanctuary in 1961, The Mara now covers 1,510 km2 (580 sq mi). All members of the “Big Five” (lion, leopard, African elephant, African buffalo, and black rhinoceros) are found in the Maasai Mara and the population of black rhinos were fairly numerous until 1960 when numbers dropped significantly due to poaching.